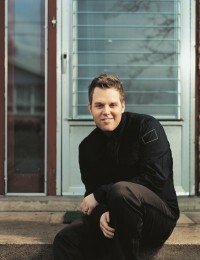 MATTHEW WEST had a song named Christian Song Of The Year in 2003. Now we Brits find out what all the fuss is about. Tom Evans reports. With his album 'History' about to be released in the UK through Fierce! 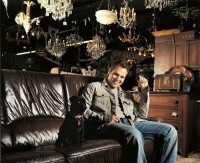 Distribution, American singer/songwriter Matthew West's rise to prominence has been something of a rollercoaster-ride. Having a career that was almost over as soon as it began, West was finally to establish himself in the US CCM scene. His song "More" was named Christian Song Of The Year in 2003, while the tune also topped the R&R Christian Adult Singles Chart for a record-breaking nine weeks. Like a lot of teenagers West had dreams of a career in sport, having a desire to play baseball for his hometown Chicago Cubs. Those dreams changed, however, when Matthew's father gave him a guitar upon his graduation from high school. Through this he discovered the emotional power music has over people. West took to the road as an independent artist when finishing college, playing across the USA in schools and coffee shops. This gained him a seal of approval from the National Association of Campus Activities. Slowly, through his songwriting skills and charismatic stage presence, he began to attract the attention of the music industry. In July 1999 West signed to Word Publishing whilst also moving from Chicago to Nashville to continue his music career. But just as he was about to be the first Christian artist signed to country label Universal South his triumph was nearly prematurely over. The singer severed a major artery in his left arm accidentally breaking a window after he locked himself out of his home. The singer recalls being able to hear nearby construction workers praying over him in Spanish as he lay collapsed in the street. It was feared by the doctors looking after him that he would never play guitar again. Recollects West, "The experience forced me to surrender my own dreams and ambitions up to God. And so you can imagine my joy when God chose to restore my arm and I was able to play guitar once again. That's why the 'Happy' project was such a true statement for me at the time and why 'History' is a continuation." By one of those strange industry hiccups, the 'Happy' album never received a UK release despite its major American success. But now, with 'History' out in UK Christian bookshops, British fans can hear for themselves what has made Matthew's carefully crafted music so successful. Matthew West was a co-producer on his second album, alongside Kenny Greenberg and Jason Houser. Musically 'History' has a large range of influences from the acoustic "The Last Ones", to the gospel approach of "Get Away" to "Out Of Time" which has a definite resemblance to The Beatles. The album, however, certainly has a guitar-driven theme in a pop style throughout. Though it's West's colloquialisms which stand the album out from the crowd. "I ended up landing on a real concept for this album, instead of just putting a bunch of songs together," says the singer. "I've always been creatively fuelled by the chance to do a whole album that speaks and communicates something from start to finish." One of the standout songs on the album is "Next Thing You Know" which tells the tale of how a 13 year old West found Christ. "I was watching TV and stumbled upon a Billy Graham Crusade as he was giving the invitation," remembers West. "He was talking about a God who could forgive people of their sins and all they had to do was accept him into their hearts. I remember my Mom came in and found me watching a preacher on TV and knew something was different. She asked me if I wanted to pray and I accepted Christ into my heart. But beyond my own story, I also want the song to encourage people to find their own story." As personal as the record is, one of the standout tracks is the acoustic "The Last Ones". The compassionate song tells the tale of a 10 year old girl who has been diagnosed with Down Syndrome. Matthew and Taylor first met before the singer undertook an engagement in Kansas City. There was an immediate bond between the two. Comments Matthew, "From the first moment I met her, I felt like there was something really amazing about this girl. In the past when I would walk by a child or an adult with Down Syndrome, my first thought was to feel sorry for them because I thought they'd never be like everyone else. But the more I got to know Taylor, I realised that maybe she was feeling sorry for me. She seemed to have something inside that told me she knew something I didn't. She just loved people regardless of where they came from." West then tells of how the girl asked a homeless man she encountered in a restaurant for a hug; "the man didn't know how to respond. Her mom let her go and she gave him the biggest hug ever. She looked at the man and he had these big tears streaming down his face. God can make history with a girl like Taylor." Matthew West is philosophical, not just about his new album, but also about whatever God has in store for his life. He has a certainty that, no matter what, he has full faith in whatever lies ahead for him. "I'm realising God is making history with my life, not just with the chances to write a hit song or play in front of thousands of people, but he is shaping my history throughout all the moments of my life," declares the singer. "I hope that 'History' can be a reminder to never underestimate God's plan for our lives. Because every moment that we are alive, history is in the making."